I finally set aside a little time to do some personal sewing. Goodwill had their monthly 50% off sale so I set out early Saturday morning to do some thrifting. I came home with 3 bags full of clothes for a grand total of $63. Can't beat that. I found a jacket and a Gap t-shirt for me. I scored a dress, skirt, and top for Harper. For Miller I found a Cars t-shirt, 2 pair of pants, and 2 cute short sleeved button down shirts. Mitch got a brand new Brooks Brother shirt. Then I racked up on t-shirts so that I can make Harper some comfy play dresses or skirts for the summer. Plus three wool sweaters for cozies. Mitch took the kids to the park so that I could sew. So I made a dress for Harper. I used three different t-shirts. The main shirt was from Children's Place and was a little too big, but I was able to still use the existing neckline so that eliminated a little work. I am not sure what's going on here. I think Miller was a little jealous that I was not photgraphing him. The turquoise shirt that I used matched the main shirt perfectly and it had manager on the sleeve. So I used it for the sleeves. Then on Sunday afternoon I made myself a little travel purse. Not that I have plans to go anywhere, but you never know. It will be perfect for a quick trip to the store or when I just want to carry a couple of things with me. This was my first attempt at a magnetic closure. It is a little wonky, but good practice. 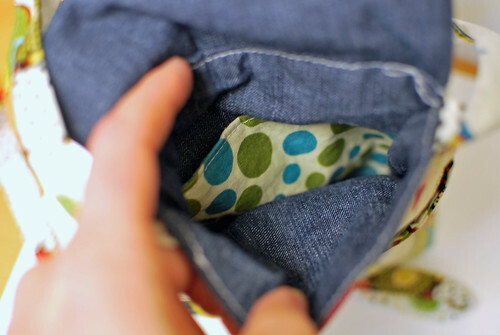 There's a pocket on the outside. I used this tutorial as a guideline. I added a little pocket inside. It was really nice to finish a couple of things for us. So cute! Both of them. 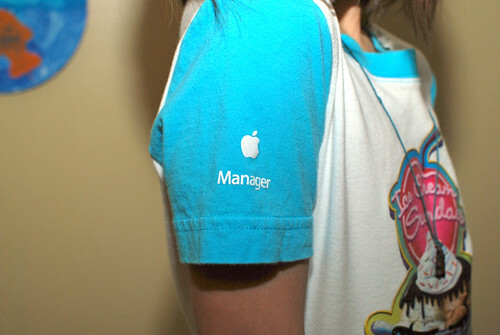 I love the Apple manager sleeve!! It is nice to make a few things for yourself sometimes isn't it?! 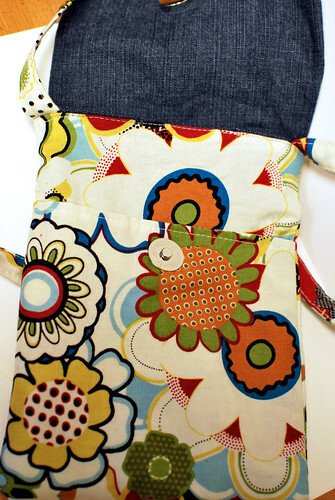 I did a magnetic snap on my laptop bag and really like it, but didn't do one on my little bag...I didn't have another one, and now I wish I had done something just in case (which it inevitably will) it falls onto the floor in the car or something. Ah well. Live and learn. That is so cute! I love her dress with all the colors and "manager" on the sleeve. :) I really want to get to goodwill to thrift some old tees for new clothes. I've seen such creative things done with them. Love your little purse, too. Very cute! Love the Manager on the sleeve. I love hitting the jackpot like that at the thrift store!! Awesome. I found myself a pair of Express jeans for $3 the other day. Yeah! 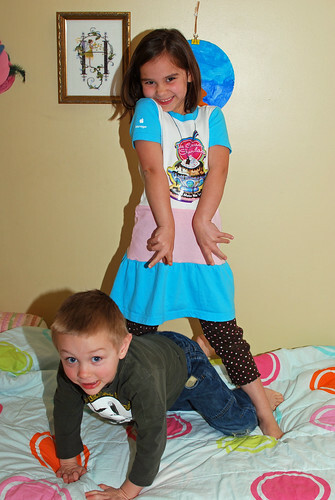 the tshirt dress is so cute, and a perfect play dress too! 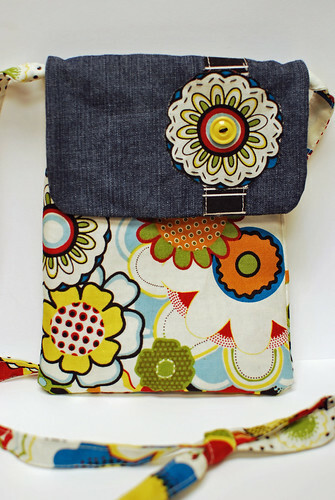 I really like the little purse - need to make something like that for myself. 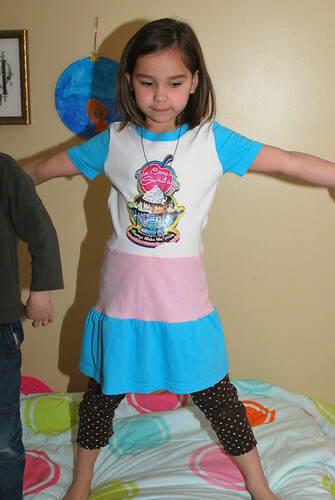 Love the dress, great way to use some funky t-shirts. The purse is cool too, thanks for the link to the tutorial. These are great! You and my sister would get along so well, she is a big time thrift shopper and scores some amazing deals.